Conor Washington in action against Southend. Photo: Joe Dent/theposh.com. Reports of a Championship bidding war for Peterborough United striker Conor Washington have emerged. Yesterday’s (January 17) edition of the Football League Paper claims eight Championship clubs are now chasing the in-form 23 year-old. But the Peterborough Telegraph believes there could be as many as 10 second-tier teams trying to prise Washington away from the ABAX Stadium. A fee of £5m was suggested in yesterday’s report. Derby, Hull and Sheffield Wednesday are the latest clubs to be linked with a player who was performing at United Counties League level four years ago. 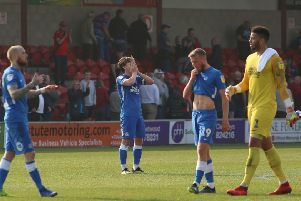 It’s known that Wolves, Reading, Cardiff (who are now under a transfer embargo), QPR and Birmingham have already registered an interest, while Ipswich and Charlton were both represented as Posh drew 0-0 with Southend in League One on Saturday. Bournemouth scouts were also at the ABAX Stadium. The Premier League side’s manager Eddie Howe is a long-term admirer of central defender Jack Baldwin, who was outstanding again at the weekend. Posh have consistently stated they would be selling one, maybe two players during the current transfer window. Manager Graham Westley confirmed that likelihood in his press conference ahead of the Southend match. Washington’s 15 goals this season make him the most likely to depart, although Posh are understood to have potential replacements lined up.